In celebration of what would have been his 100th birthday, we take a closer look at Achille Castiglioni and shine a light on one of his most iconic designs: the inimitable Arco Lamp. Mischievous, full of energy and tirelessly inquisitive, Achille Castiglioni was a breath of fresh air when he bounded onto the Italian design scene in 1944. 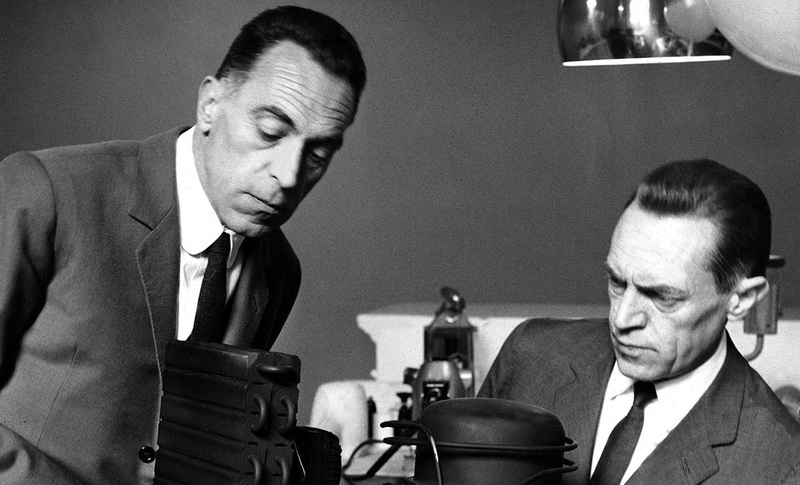 Achille Castiglioni, alongside his brother Pier Giacomo, was one of the most important industrial designers of the 20th century, producing more than 150 products for Flos, Zanotta and others during their careers. It was this playful attitude that allowed Castiglioni to think outside of the box and create some of the world’s most innovative and influential furniture and lighting designs. These included his 1957 Mezzadro Tractor Seat, the cartoon-inspired Snoopy Lamp of 1967 and, of course, the elegantly arched Arco Floor Lamp. What’s so special about the Arco? Designed in 1962 by Achille and his brother Pier Giacomo, the Arco Floor Lamp quickly became a firm favourite with design enthusiasts thanks to its unusual and unique appearance. Sketch of the design processes behind the Arco. One of its most distinguishable design features is its semi-circular arch ('Arco'), which holds the height-adjustable aluminium shade. The arch can be swivelled to suit your specific lighting needs, making the Arco a highly flexible product. The chunky base is made of solid white Carrara marble, which is sourced from the quarries in the town of Carrara in the Italian Alps. This particular marble has been sourced and sought-after in Italy since the Roman times and continues to be utilised for the most sophisticated of designs. The beauty of the Arco is that each individual design will always be different from the next, with subtle variations in the authentic Carrara marble. In 2012, an advanced LED edition with a dimmable function was born to mark the 50th anniversary of this much-loved classic, making the Arco even more desirable than ever. The question that Achille asked himself at the start of every design process was: will this solve a problem? If the answer was no, then it simply wasn’t worth his - or any potential consumers’ – time, so he abandoned the project and quickly moved on to something else. When conceptualising the Arco, however, the answer to that question was a resounding yes. The problem the lamp needed to solve was one that every home encounters at some point: wiring. Could Achille create an overhead light that would negate the need for fiddly wires or a complex installation? He would certainly give it a go. Achille’s inspiration for the Arco, however, came from something quite ordinary – as was so often the case with his designs – and this time around it was a streetlight. Streetlights are able to project light a considerable distance away from the base and provide balanced, diffused illumination – an ideal quality for an overhead lamp. Recognising the potential of modelling his design on the humble streetlight, and wanting to overcome the problem of complicated wiring, Achille eventually created the Arco – a free-standing floor lamp able to project light nearly 8ft from its base. It’s a simple design, but one that would revolutionise the way we illuminate our homes. The Arco has a solid marble base that weighs in at around 65kg, which is not ideal when it comes to moving it around. This is why Achille – in his usual humorous and inventive fashion – incorporated a hole within the base of the lamp so that a broom handle could be slipped through and allow two people to carry it. It’s clever details like these that make Achille’s designs unquestionably his. They say imitation is the sincerest form of flattery, which might explain why the Arco is one of the most replicated lighting designs of all time. Type ‘arco reproduction’ into Google and you’ll be only a few clicks away from a lower-priced alternative but without any of the genuine features that make the original Arco so special. The liquid-like shine of the pressed, polished and zapon-varnished aluminium shade? Dulled. The elegant swoop of the iconic satin-finish stainless steel arch? Fragile. The premium quality of the original Italian white Carrara marble base? Nowhere to be seen. If you want to be sure that you’re purchasing the original Arco, be sure to purchase it from a reputable retailer like Nest.co.uk.